I’ve got to make a confession: I was never particularly wowed by the Game of Thrones score. And since I’m already about to get sent down the streets of King’s Landing to a chorus of “Shame! Shame!” for that fact, another confession: I was never particularly wowed by Game of Thrones in general. See, A Game of Thrones has been a prominent element of my life for a long time now, not via fandom, but via business. I am connected to the company that made the card game long before the HBO show was ever conceived and that now makes the board games, including the one now based on the show. (I actually sat in on a meeting in which Martin mentioned being approached by two guys about turning the series into a television show—hmm!) For years, I knew as much as I could about the series without actually having read the books, and when I finally did read them, I found them challenged. George R. R. Martin is an incredible world builder, but I felt that most other elements of A Song of Ice and Fire were lacking. I started the show with the same amount of enthusiasm with which I’d read the books, which is to say very little. However, the HBO series wowed and enthralled me in ways I hadn’t expected—and, in doing so, granted me a substantial appreciation for the books. As the show went on, I found myself debating and criticizing departures from the books and discovered an ability to view the original material with a newfound admiration. And on the flip side, my favorite character in the series is Cersei Lannister, a fact that I struggled to articulate to fans of the books; the show presented her in exactly the way I interpreted her, putting all of the things I loved about her front and center in an accessible way. Experiencing anything with a heavy element of skepticism often makes for a better experience. Less forgiving of flaws, sure, but where praise is earned, it is earned absolutely. Here is where it comes back to the soundtrack and concert. 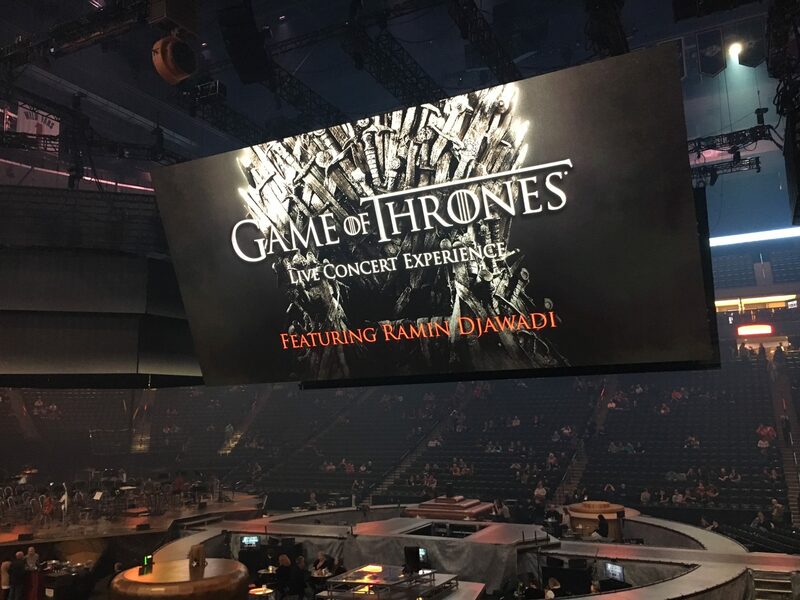 Just as the HBO series provided a new lens through which to view and appreciate the books, the Game of Thrones Live Concert Experience had the same effect on me regarding the music of Game of Thrones—and then some. When the show opened with the main theme performed by a full orchestra and choir and my forearms erupt into horripilation, I knew this show was yet another prism to reveal what I had overlooked. Part of the stage of the Game of Thrones Live Concert Experience. To call this production “ambitious” wouldn’t quite cover it. The original date to open, February 17, was pushed to February 20, thus altering the entire tour schedule. Ticketmaster offered this explanation: “As a result of the enormity of the tour’s production, time required for stage construction and an ambitious routing schedule, the tour needed to alter the tour stops.” It is easy to see why the logistical challenges occurred, and to forgive and forget them. The stage in and of itself was a thing to behold—an echo of the mechanical-esque models from the opening credits, sprawling across the arena floor. Platforms of different shapes and heights were joined by walkways; giant, multitiered screens loomed overhead. As times change, so does media. I’ve spoken before about events having to reinvent themselves to stay relevant and engaging in the digital age, often at a cost. For a moment I worried that the spectacle of it all would completely swallow the performers, but the key soloists roamed accented, not overwhelmed by, the stage. That said, a few features of the stage were brilliant in concept but did not work as effectively in execution. 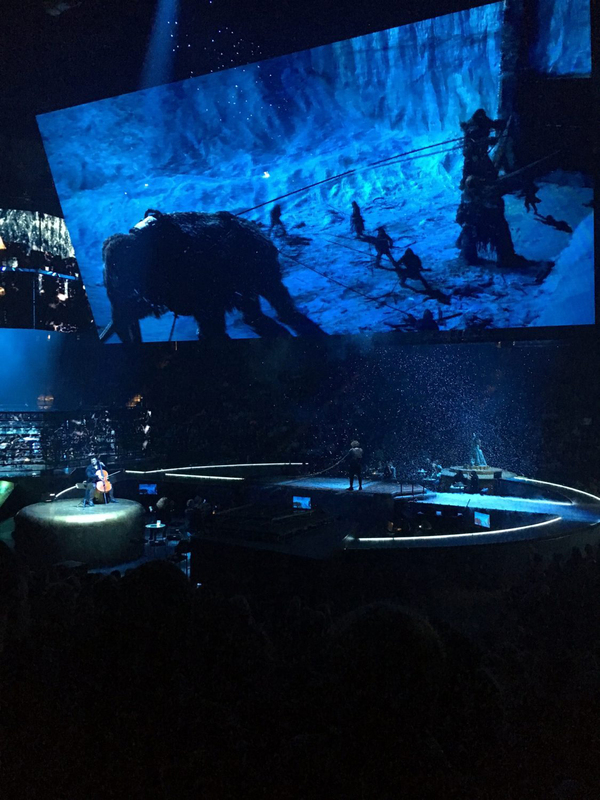 For example, when House Greyjoy was featured, the cellist playing was seated on a glass platform that held a few inches of water. While this small element was supremely clever, it could be easily overlooked. 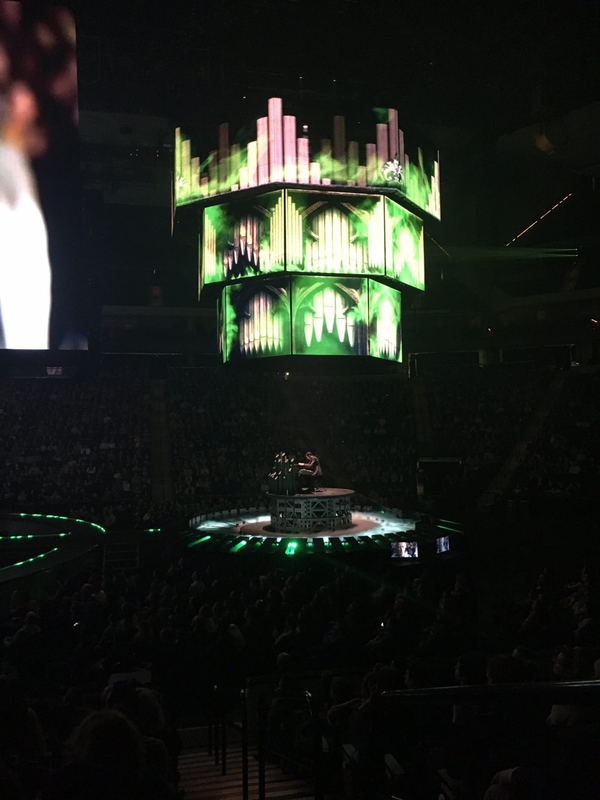 I want to be careful with show spoilers—and the spoilers were plenty, so make sure you’re caught up completely or don’t care if you want to see this concert at any of its other stops—but the stage effects went far beyond incorporating the screens. Snow swirled and sprinkled the stage, flames erupted, trees grew . . . all the familiar symbols and elements of Westeros and beyond were incorporated to build a truly immersive experience. Composer Ramin Djawadi was delightful and giddy with a contagious enthusiasm, and he personally helmed the keyboards for “Light of the Seven,” the piece that unquestionably stole the show. The other soloists were worth the price of admission alone, incredibly talented musicians with commanding stage presence who were clearly just as invested in the score as Djawadi. One even built an incredible horn to provided the chilling sounds of “The Wall.” A choir marched up in down the stage in somber robes, donned Sons of the Harpy masks, and flickered through the crowds. Some tracks were altered from their original form for the show; many adjustments were improvements, some were not. “The Rains of Castamere” was a big letdown—maybe I’ve been ruined by the brilliant Sigur Rós version, but the song at the show lost any sense of the eerie foreboding present in every other rendition of that piece. On any show’s opening night, things can and do go wrong, but when the soloist minced the lyrics to the most iconic song of the series, I felt my entire seating section cringe. 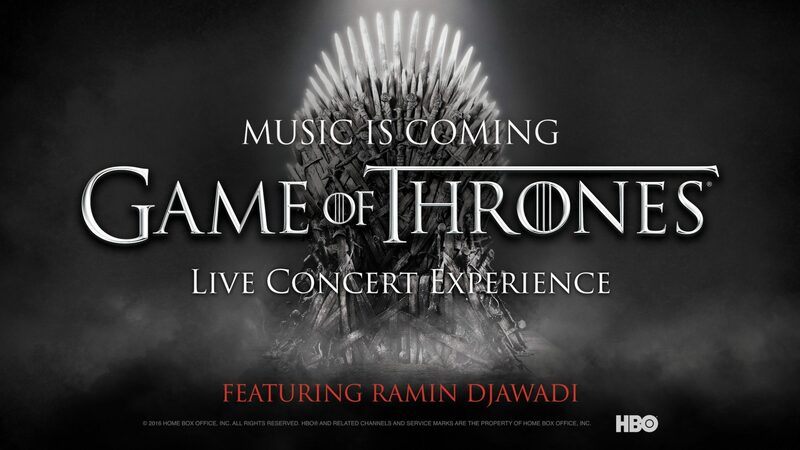 The Game of Thrones Live Concert Experience is an arena-only show, as required by the 360-degree complex stage. Seating options promise “not a bad seat in the house,” but that doesn’t mean some aren’t better than others—there are seats within the curves and walkways of the stage, for example, mega exclusive sections broken into “Lannister” and “Stark.” If that’s too intense, the VIP tickets offer seats down on the arena floor to the side of the set (and other goodies) if you are looking to spend around 350 gold dragons . . . er, dollars. There was merchandise available at the show, but the booths were somewhat hidden and the product wildly expensive. A single T-shirt was priced at $40, a lot even by concert standards. As a result, I heard attendees in the merch lines bemoaning the prices, or not having enough money to grab something. If you would like to take home some merchandise, plan to bring a little extra cash. 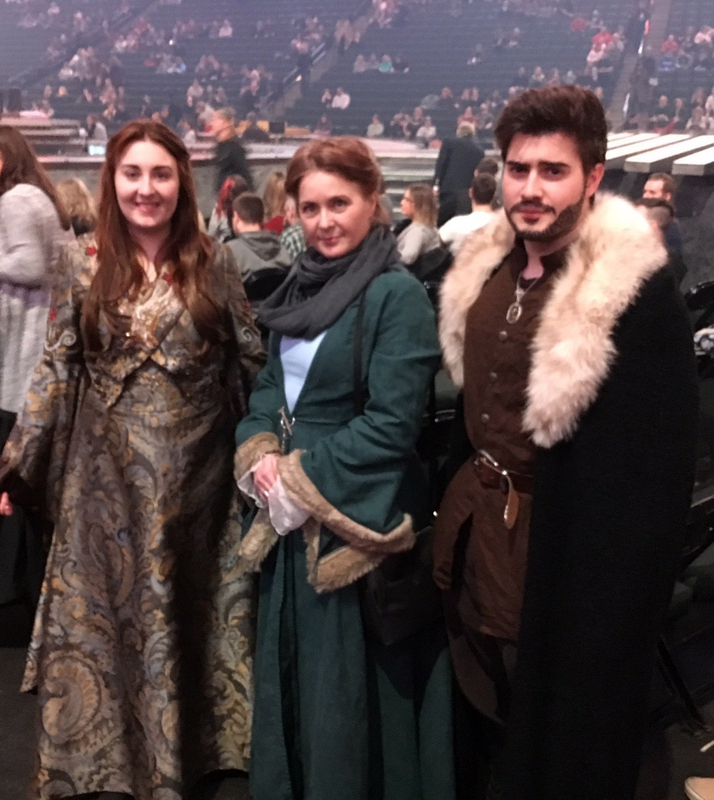 Fantastic Sansa, Catelyn, and Robb Stark cosplayers. Aside from the music and show, watching and listening to the audience was a treat in itself. There were cosplayers, avid fans old and new, book loyalists, and people who had only ever seen the HBO series. And me, who walked away surprised, humbled and a little embarrassed, with a new and deep appreciation for the score I had previously only regarded as “okay.” Its interesting to me how my personal relationship with all the media elements of Game of Thrones has advanced, hesitant and plodding, sometimes full of twists and surprises, and ultimately, extremely rewarding. Round and round, this Game of Thrones. You win or you die. And music is coming. Costumes from the Game of Thrones HBO series.